In 52BC nearly all of Gaul was in revolt. Vercingentorix, leader of the Arverni was made supreme commander of the Gallic forces. 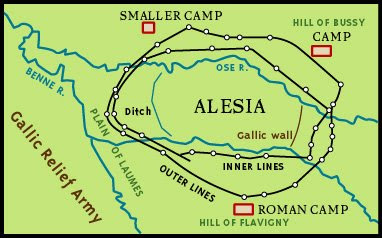 After attacking Caesar’s men on the march, Vercingentorix and about 80,000 Gauls retreated to the Mandubii town of Alesia. Caesar followed and lay siege to the town with roughly 50,000 men. Caesar's forces included Germanic cavalry. Caesar saw their mounts as inferior and gave them all Roman horses. After the siege construction began the Gauls attacked with their cavalry. The Roman and German cavalry slaughtered their attackers and pushed them right up to Gallic defences of the town. Legions were placed in front of the camps to protect the siege construction. That night, Vercingentorix sent the cavalry fled the town to gather reinforcements from the whole of Gaul. The Romans continued their construction. Caesar described the siege works in great detail. The innermost ditch was made 20ft. wide with vertical sides. 400 paces back from there two more ditches were made. Each were 15ft. across. Water was diverted from the river to fill the inner one. Behind the ditches the legions made a rampart 12ft. tall. On top of this they constructed a parapet and battlements. Large sharpened stick projected form the side, where the parapet and rampart met. Every 80ft. along the lines a tower was built. Caesar’s men had to scavenge for supplies at a great distance from the siege. This enticed the Gauls to make frequent raids on the depleted Roman forces. To counter this the Romans gathered tree trunks and branches, sharpened the ends, and lodged them in 5ft. deep trenches. They made 5 rows of these. In addition to this pits were dug with a single sharpened stake projecting from the center. They were then carefully camouflaged with branches and leaves. These “lilies,” as the Romans affectionately, called them were laid out in a “quincunx” pattern. (resembling the five side of a die) Finally, logs were dragged up in front of these and were covered with iron hooks. This same procedure was repeated with a second line to defend against the Gallic relief force. The completed outer ring stretched for 14 miles around the town. Both the Gauls and the Romans had collected about 30 days worth of food. About 240,000 infantry and 8,000 cavalry gathered to come to Vercingentorix's aid. In command was Commius (of the Atrbatian tribe), Viridomorus and Eporedorix (Aeduans), and Vercassivellaunus (an Atrebatian and cousin of Vercingentorix) While this force was on it's way the Gauls inside Alesia were beginning to run low on food. To conserve the supplies Vercingentorix had the Mandubii townspeople leave. They pleaded with the Romans to be allowed out, but Caesar sent them back to put strain on the Gallic resources. Commius and the others finally arrived and camped on a hill less than a mile form the Roman lines. The next day they filled the entire plain 3 miles across with cavalry, skirmishers and archers. The Gauls inside came out, began filling in the first Roman ditch, and prepared for the attack. Meanwhile, the Roman cavalry was lead out of their camps to meet the Gauls. The fighting began at mid-day and continued until sunset with n definite outcome. Then the Germans condensed their attack and routed the Gauls. Those inside Alesia saw all of this from their vantage point. They marched back in their gates. The next day the relief force outside made ladders, whicker bundles (to fill in the ditches) and grappling hooks on poles to pull walls down. They yelled out to the Galus inside as the signal for a combined attack. They used slings, arrows and rocks to force the Romans away from their defenses. The Romans used slings and catapults to fend them off. Vercingentorix sounded the trumpets and marched out of Alesia. Mark Antony and Gaius Trebonius were the commanders at the point of the attack. They moved men in from the towers farther away to where fighting was heaviest. The Gauls did well at first, but as they reached the area of the pits they lost their momentum. Their were heavy casualties on both sides, but there was no breach of the walls. Fighting continued all night long. At dawn the Gauls retreated to their camp. The Gauls on the inside only accomplished to fill in the ditches. They also retreated. On the third day the Gauls outside did more reconnaissance and chose the weakest point of the siege works to attack. At the northern part of the defences a large hill made it difficult to construct a good wall. The only fortification here was a Roman camp outside the ditches. Gaius Antistus, Reginus and Gaius Caninius Rebilus were at the camp commanding two legions. The hill here sloped down toward the Romans, leaving them at a slight disadvantage. The Gallic commander, Vercassivellaunus, took 60,000 men and marched off to this point. They left at first watch and arrived at about day-break. They concealed themselves on the opposite end of the hill and rested. At noon the Gallic cavalry rushed in and began the attack. The Gallic infantry marched out to join them. At this same time Vercingentorix stormed out. The Romans were sandwiched in between to attacking forces. The pits were filled with dirt and the Gauls got close in testudo formation (the tortoise formation: they bunched together making walls and a roof with their large shields). The fighting was the most fierce at the northern camp. Caesar sent Labiens with 6 cohorts to help his men there. Brutus and then Legate Gaius Fabius were sent with more men. Caesar then had to come himself bringing 4 cohorts and some cavalry from the nearest fort. He sent more cavalry around the great hill to come behind the Gauls. From their higher ground, the Gauls saw him coming and fled. They were met by the charging cavalry. Sedulius, in command of the Lemovises, was killed and Vercassivellaunus was taken prisoner. 74 Roman standards were reclaimed. This was it for the Gauls. The forces inside abandoned hope and returned to the town. Around midnight the relief force fled, their rear-guard being harassed by Roman cavalry. The following day Vercingentorix and the ringleaders of the revolt surrendered.